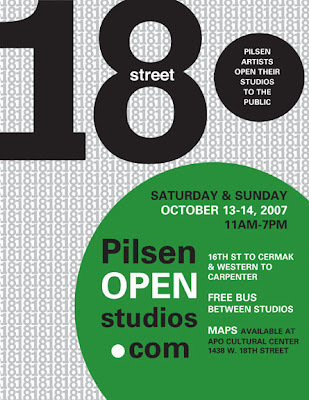 18th STREET, PILSEN – On October 13th and 14th artists from the Heart of Pilsen will open their doors to the public in the 18th St. Pilsen Open Studios, the largest opening of Latino/a International artists’ studios in the city of Chicago. The weekend event features 37 spaces-most of them private studios-and more than 60 artists. Dozen of artists who grew up in the area or have lived and worked for years in the community will participate. Neighborhood cafes and community art spaces are also showing work from artists who have connection and participate in the neighborhood. Participating artists include well-known painters, muralists, sculptors, performers, installation artists and printmakers as well as emerging artists. Pilsen has long been known for its murals and culture and dozens of artists’ studios and homes are scattered throughout the Latin American and Mexican/Mexican–American neighborhood. This is the sixth year Pilsen artists have opened their studios. The weekend represents an opportunity to get insight into the art, the artists and a closer glimpse to the process of creating works of art. During the weekend of the 13th and 14th interested individuals will have the opportunity to share a unique experience with the artist(s), ask questions and discuss ideas. The space where art is created has a doorway to the past while the artists create in present time. To Gabriel Villa, an oil painter and participating artist, “You get to see how an artist really works-you’re in the environment. You get to see how an artist think”. There will be a free bus provided by LATINO EXPRESS between studios all day Saturday and Sunday. POLVO shows cutting-edge and contemporary art, run. This year artists participating are Harold Mendez, Brandon Alvendia, and Derek Chan. 773.344-1940. Visual artist, MARK NELSON, will exhibit a workshop of mysterious political-parody paintings, sculpture and artifacts dealing with current events. He has received several Fellowship Awards from the Illinois Arts Council. This past summer the State Department purchased a mural from Nelson which was installed at the new U.S. Embassy in the Republic of Panama as part of their permanent collection..
ROBERTO FERREYRA He studied at the School of Fine Arts “La Esmeralda”, in Mexico City. He has a long list of solo and group exhibits in Mexico, Canada, Cuba, U.S.A., and other countries. He has been a professional artist since 1978. Ferreyra came to Chicago in 1993 for the first time invited by Urban Gateways and later in 1995 through the Sister Cities International Program when he decides to make Chicago his permanent residence. His works are like life codexes, images influence by his Mexican heritage with strong colors, characters, stories, almost taken from a dream. He prefers watercolors but his draftsmanship is outstanding, and is an accomplished printmaker. TRANSPORTATION: CTA 54/CERMAK BLUE LINE, exit at 18th street, Damen and Western.